The most important part of your show is the wiring. This heavily affects the cost, ease of setup/take down, and how easy it is to fix problems. It is important that you thoroughly understand wiring, before you choose how you want to layout your show. First, let me list some of the basic recommendations as a starting point for your display. Only drive fifty 5Vdc pixels without power injection (assumes standard 60mA per pixel). Only drive one hundred 12Vdc pixels without power injection (assumes standard 60mA per pixel). Do not use ground loops in your power. Multiple small controllers around the yard minimize wiring and cost. Finally, you should be able to measure the current to your strings and determine the voltage at the end of a string. Maximum current is when the lights are all white. For pixels without internal regulators the voltage drop at the end of the string should be no more than 10%, 4.5Vdc for 5Vdc and 10.8Vdc for 12Vdc. The maximum voltage drop for strings with built in regulators depends upon the minimum input voltage for the regulator, so check the specifications for your specific pixels. An example of the wiring for driving a typw WS2801, with two output control lines. 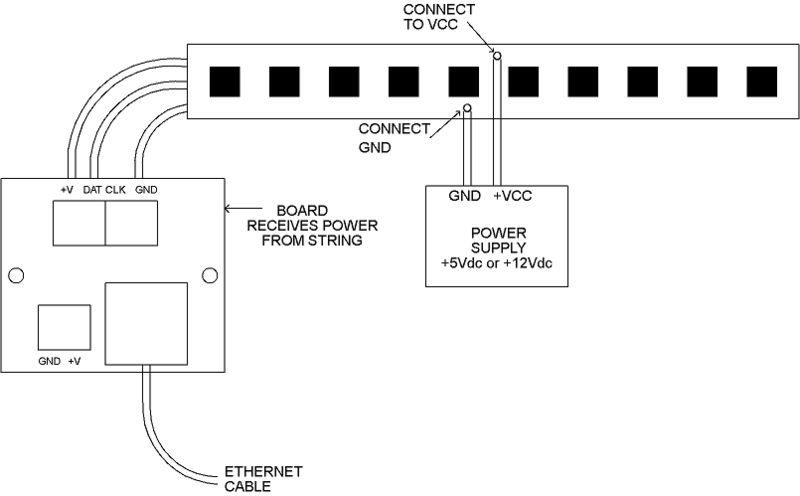 It is recommended that the power supply voltage be inserted in the center of your string. 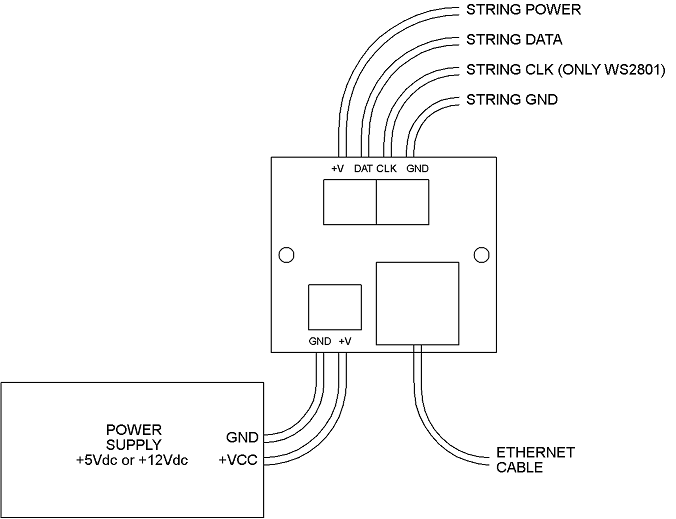 The circuit card will receive power off the string if the +V signal is connected to the string. An example for the driving of a WS2811 type LED strip with the power supplied in the center of strip. Note that you do not have to cut the strip to insert the power. Just solder the power wires directly to the strip.